This ant looks like it’s wearing the insect equivalent of tuxedo shorts. Formal wear and pasty white legs. If you visit Cape Tribulation, keep an eye out for these little insects. Only 2-3 millimeters long, they are one of the most common ants in that area. 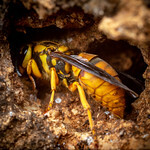 I found them nesting in nearly every rotting log I looked at. Insects don’t have to be rare to be beautiful! I can just imagine the amount of smack talk they get behind their backs from the other species. -Damn stuck up broads, think they are so high and fancy. Showoffs, all of them. -Roight mate, I mean come on, tux, tie, and stilettos while working 9-5 with waste disposal, la di dah! Naw: that’s guy talk…These girls are too busy bringing home the bacon or the beetle as it were. Very, very cool. I love the photo of the major. Are those out-of-focus mites on the beetle? 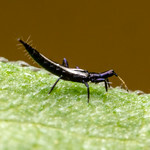 I remember an old (and no doubt embarassing to you) photo of these from the myrmecos.net days. The majors seem are the only ants I can think of that have a red, white and blue color scheme (well, red, blue and white). If the minors didn’t have that black middle, they’d be all-pasty looking like the palest ant on Earth, Nylanderia phantasma, one that I think has not proven very photogenic thus far, unless you know otherwise. Is this a leaf-litter nesting species? If so, there is something going on (a pigment-pattern adaptation to something). This is the third continent from which I have seen specimens with bold yellow and black “banding”, with specimens from Africa and Jack’s new “harlequin Pheidole” species and potential mimicry ring among them. Very cool; I also like the sculpturation of this minor.